Orientation models for the Form application, it can be: Single record, Multiple records, Editable grid and Editable grid view. This form orientation allows you to edit only one table record at a time. You will be able to page the form to navigate record by record. 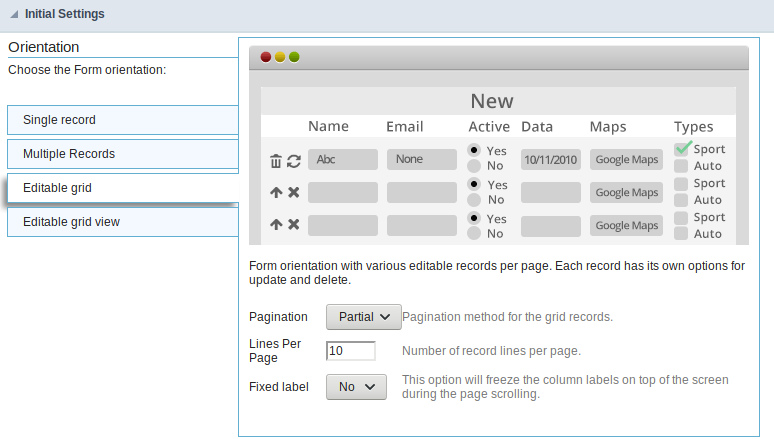 Form orientation with various editable records per page. Update or delete processes will run on selected records via check box. You can set as many records per page as needed to update, to delete or to add new records. 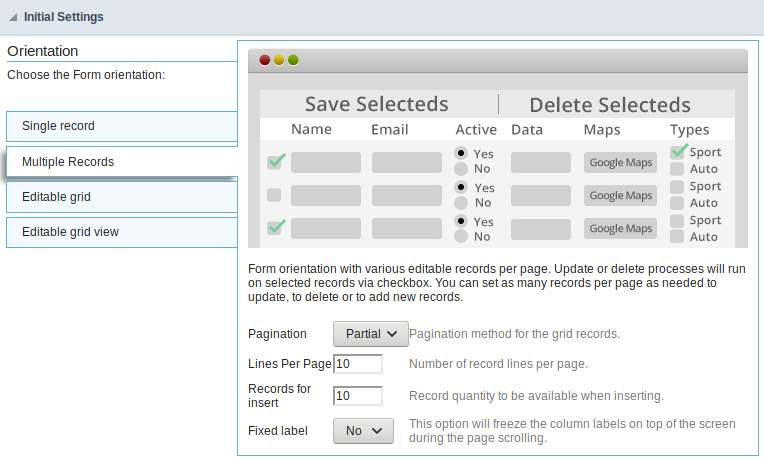 Pagination : Paging type for the multiple records form, you can choose if it is going to be partial or total. Lines Per Page : Quantity of rows of records per page, this option is available only when the pagination is set as “Partial”. Records for insert : You can set here the quantity of rows of records per page in the insert mode in order to add multiple records at a time. 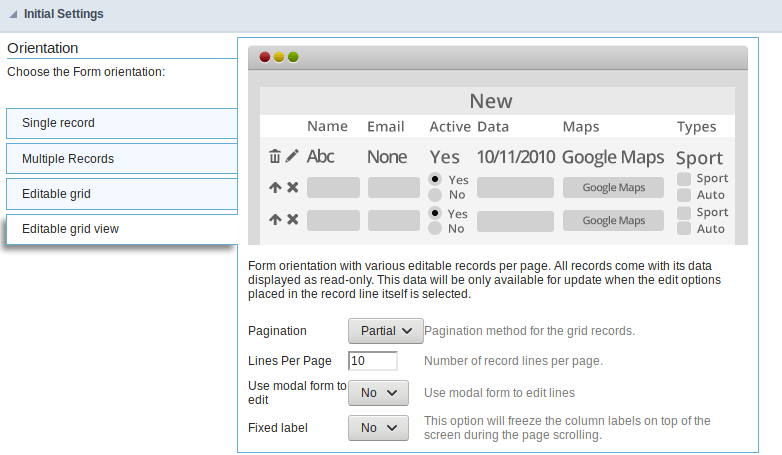 Form orientation with various editable records per page. Each record has the update and delete controls available in its own line. 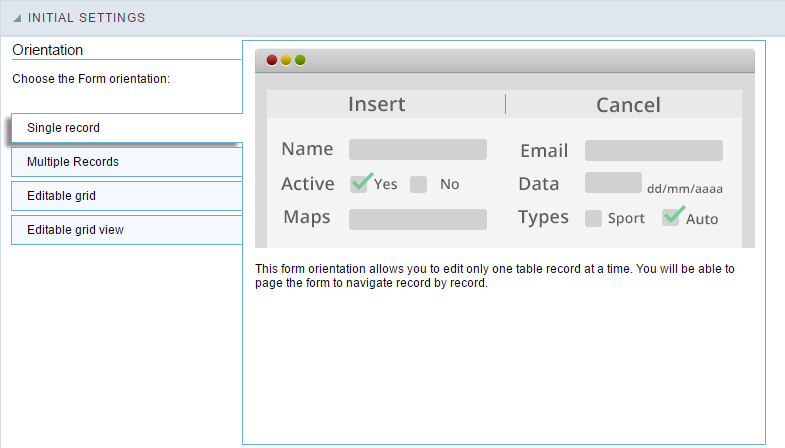 Form orientation with various editable records per page. All records come with its data displayed in a read-only format. These data are only available for update by selecting the Edit option in the record itself. Use modal form to edit : Use a modal form to edit the records when you click to edit the record.